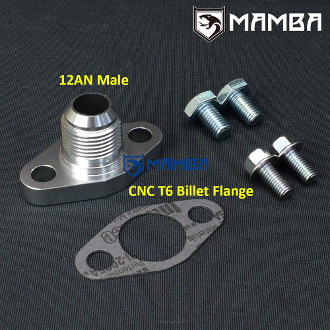 Turbo oil return/drain adapter flange with integrated 12AN fitting. For use with all the turbochargers listed below. Machined from T6 aluminum to be lightweight, durable. Highest quality available. The flange has a 12AN male fitting built in & fits any 12AN hose end. Solid 1 piece design, low profile, perfect for tight spaces.